Basically, this scene manager allows you to create init, update and draw for each scene (as well as anything else you want to cook up, of course). to grab the current scene thats running so you can modify it or its variables, you can simply create a local variable called 'self'. to switch to a scene, you'll need to comment the ID of that scene so you don't lose track. 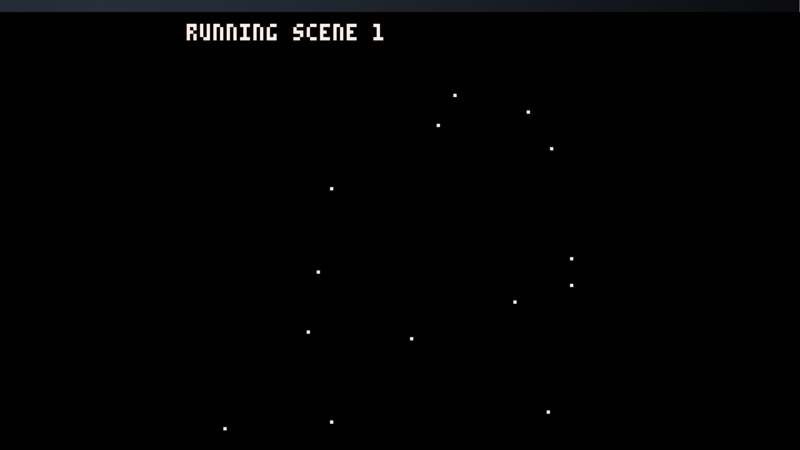 I recommend you have a function that launches at the init() of your game that creates all of your scenes for you. command to load a scene: scn_mng.go(id) where id is the scene number you want to run. However, I saw you posting similar systems on Twitter and I wanted to bring up something you might not be considering. In the lower right corner Pico-8 will track how many 'Tokens' your code is using. The concept of a Token is a bit nebulous but basically every time you type an operator, a command, a function, a variable you spend at least a Token. When you hit 8192 Tokens, it's game over. You can't put any more code in your cart. In fact, your code won't even run until you can somehow go below that limit again. Note that this is not the same as the length of the code. Shorter variable names or compression won't save Tokens. When doing bigger projects in Pico-8, being efficient with Tokens will be a very high priority. Every bigger project is bound to hit that limit. Your efficiency will translate directly into being able to implement more features. OOP is a highly token-inefficient way of coding. Every single time you access a property of an object it costs you an additional Token. So every time you use objects, you should ask yourself: "Does this absolutly HAVE to be an object? What am I actually GAINING from this being an object?". Your sample code with the scene manager is 299 Tokens. And the code below is your sample rewritten. It has no scene maner and no OOP. But it still uses the same function pointer trick you applied and it's not that much harder to use. It's 163 Tokens. I'm not bringing this up to dunk on your system. I'm sure it has its place. And maybe you already know all of this and you had your reasons. I wanted just to make sure you're not wasting your time developing systems that end up causing you more problems than they solve. Cheers man, keep it up! this one uses 44 tokens and looks cleaner.